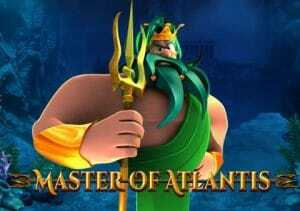 Join Poseidon, the ancient Greek god of the sea, in Master of Atlantis, a superbly designed 5 reel, 40 payline video slot from Blueprint Gaming. Look out for the mighty trident that can appear on any spin and transform multiple symbols into the same one. There’s also a free spins feature where each scatter that lands can award a payout of up to 100 times your total bet. Play this medium variance game on your PC, tablet or mobile device from between 50p and £500 per spin. Video slots from Blueprint Gaming are usually easy on the eye and Master of Atlantis is another good-looking affair. With the sea bed in the background, you’ll see the ruins of Atlantis faintly visible in the distance. On the reels are A to 10 royal symbols as well as a pearl, a treasure chest, a shark and a kraken sea monster. The Master of Atlantis logo is the most lucrative symbol, awarding a payout of 0.2, 1, 4 or 20 times your total bet if you land 2, 3, 4 or 5 on a payline. The Greek letter Omega is the wild. This substitutes for all other symbols apart from Poseidon which is the game’s scatter. The wild can hit on all 5 reels. There are 2 extras to note in Master of Atlantis. Trident Strike feature – this can activate at random on any spin. Poseidon’s trident will fly onto the reels. The positions hit by the trident all turn into the same symbol. A new payout calculation is made with the new matching symbols in place. Poseidon Free Spins feature – this 2-stage feature is triggered by landing 3, 4 or 5 of the Poseidon scatter on the same spin. In the first part, you’ll play out 1, 2 or 3 Trident Spins. These are streak spins where every scatter that lands is held. The total number of held scatters at the end of these spins determines how much each scatter will pay out during the free spins. The minimum 5 scatter pays 1 times your total bet for every scatter that hits. If you manage to amass the maximum 20 scatters during the Trident Spins, then each scatter that lands in the free spins that follow pays a massive 100 times your bet! You’ll then go on to play your free spins. These pay out as normal, apart from the scatter which delivers its own individual reward. Up to 5 scatters can land on every free spin which helps. Poseidon can appear during this round too to add more free spins to your total or to give you another Trident Spin. There’s plenty to like about Master of Atlantis. The sound and visuals are as classy as we’ve come to expect from Blueprint Gaming and the features stack up well. That’s certainly true of the Poseidon Free Spins feature which delivers something a little different thanks to the potential from the scatter pays. As far as volatility goes, we’re in the medium range here. The myth and legend and underwater themes are enduringly popular in the online casino world. With arrivals like Master of Atlantis, it’s easy to see why. Novomatic’s Mighty Trident is also a video slot I recommend that features the ancient Greek god of the sea.